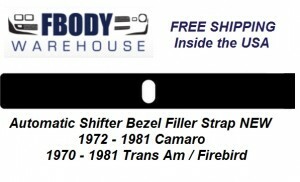 This is a new replacement shifter bezel filler strap for 1972-1981 Camaro and 1970-1981 Trans Am. This unit works on both regular automatic shifter and also the optional ratchet style automatic shifter. This unit replaces your worn or missing factory GM unit. Installs under the shifter bezel and install is easy and takes only about 20 minutes. This fills the open space on automatic cars that the shifter leaves open as it progresses through the gears. Can be used on both the stock auto shifter and also the GM optional ratchet style factory shifter. For use on automatic cars only. NOTE: Will not fit 70-72 Camaro’s with horseshoe style shifter.